In May while some fruit like cherry is swiftly arriving, some other sliently fading away from this city. But this fruit the local called níspero (medlar in English) has been steadily sitting on shelves throughout the whole month. Medlar is a little bit bigger than apricot with the same delicated golden hue. 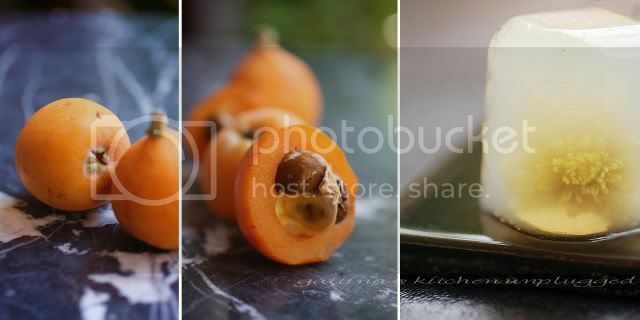 Once cut open, you'd see the seeds totally go wild though; they can be just three, or 6, or more, all tightly packed in the center, whick look so much alike to some tropical fruit in Asia. I was curious and so (... bought some, and ate some first :) :) looked up Wikipedia, and learnt that medlar is native to southwest Asia, like Iran. The flavor is claimed to be like applesauce, but to me more like plum, with a faint scent of parsimmon. To produce the liquid for this gelatina, I boiled some medlar with dried chrysanthemum in water. I could have used dried rose in order to get a better look, but I gave up the idea as this flavor right now is so perfect! Very light, very delightful! Next, to create jelly, instead of gelatin, I use a pure vegetarian option - agar-agar (see this previous post to see their difference). You can replace medlar with other acid fruit, or simply puree the medlar to be more direct when you make the juice. I took an extra step to cook the fruit all due to my allergy to most fruit... still not sure if to the fruit itself or to the pesticide that has been permeable into the fruit... but once the fruit cooked it won't cause me any allergic reaction. Anyone has similar experience like me? We don't really eat the dried flower even it is edible as it is fibery. Agar-agar and dried chrysanthemum are widely distributed at Asian supermarket if you live overseas. Bring the water and the medlars to boil, add (most of the) sugar and simmer for 15 minutes. Taste the sweetness, it requires slightly sweeter than you normally like as it will be just perfect after it's cold. Once the liquid cools off, cover, keep (including the fruit) in fridge for one day. Drain the fruit, I got 450 ml of liquid. Add in agar-agar and flower , bring the liquid to boil, keep stirring until agar-agar totally dissolved. Drain out the flower, pour the liquid in molds. Drop in the flowers if desire for garnish. If the flower floats on the top, just wait when the gelatin 50% set, push down the flower with a toothpick. Chill the gelatin in fridge until it totally sets, may take a couple of hours. That's beautiful! Now I wish I'd bought that giant bag of agar-agar at the Asian market the other day! A delightful and refined dessert! What delicate flavors! Oh these are little Devo jello hats, too cute! Now I love the taste of chrysanthemum, did you think about cooking some with the medlar to infuse the flavor within the gelatin? Then perhaps using newer flowers dropped in for the visual part? I keep saying i need to get some agar agar...gotta hop to it! Gorgeous! I've never had a medlar...interesting! Waw,....What a fine dessert! You are very creative! Waw!!! I've never heard of Medler...Looks beautiful! G, this is soooooo pretty. To pretty to eat. Simply beautiful. 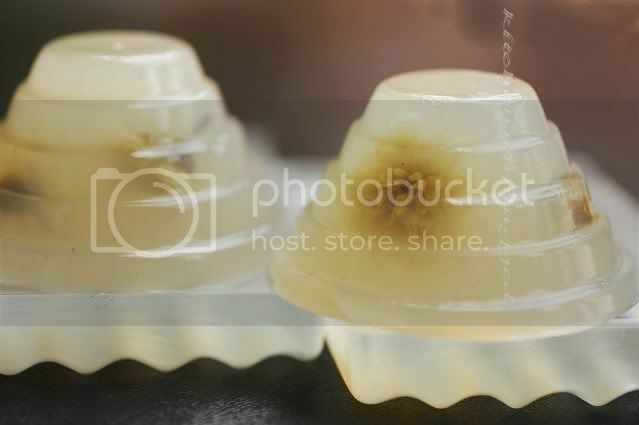 I loved the mold you used for the jelly. What an exquisite, beautiful blog you have...and gorgeous recipe presentations. I hope one day I can even begin to be this creative and skilled in the kitchen. This looks so beautiful, a very healthy dessert that one will not need to feel guilty. You've got such beautiful pictures in your blog. Greetings from Germany, and do you mind if I link your blog to mine? Thanks! We call these loquats here in Hawaii. I've got a tree on the property and am hoping to get lots of fruit this year. The blossoms smell heavenly, if you ever get the chance to be near a tree in bloom, you'll be so happy! This geletins are gorgeous and I love the delicate coloring so much. Thanks for the idea! Mentioned it in a piece I wrote titled Jell-O Cities, White House, Jello Mold Mistress of Brooklyn, Devo Too on 'Serge the Concierge'. Took the liberty to use your photo.